Pope Francis called for a two-state solution to the Israeli-Palestinian conflict during his annual Christmas speech. Pope Francis made special mention of the Israeli-Palestinian conflict during his annual Christmas message in St. Peter's Square. 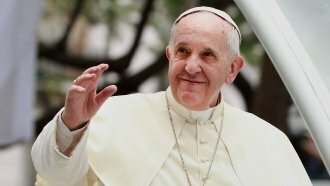 Francis asked people to pray for the conflict to be resolved with the "peaceful coexistence of two States within mutually agreed and internationally recognized borders." That's a bit more prescriptive than his message from last year, which just asked the two sides to "build together a future of mutual understanding and harmony." The pope's renewed focus on the issue might have something to do with President Trump's recent controversial decision to move the U.S. Embassy in Israel to Jerusalem, which has sparked international blowback. Francis also addressed other conflicts in his speech, including Myanmar's refugee crisis and the conflict in Syria.